Whaling has been carried out by various groups of people around the world for thousands of years. Archaeological evidence suggests that primitive whaling, by Inuit and others in the North Atlantic and North Pacific, was practiced by 3000 BC. For most of this time the level of the fishery remained quite low, though became an important part of the folklore and traditions of many groups of indigenous peoples. For a family or community living in an impoverished environment, a caught whale meant ample food over a long period. There are not that many places in the world where whales regularly come close in to the shore line, and there was always the limitation on the types of whales that could be taken by pursuing them in open boats and killing them using hand harpoons - the risks involved were very great too. Larger whale species such as Blue and Fin whales were safe from early whalers because of their enormous size and speed. 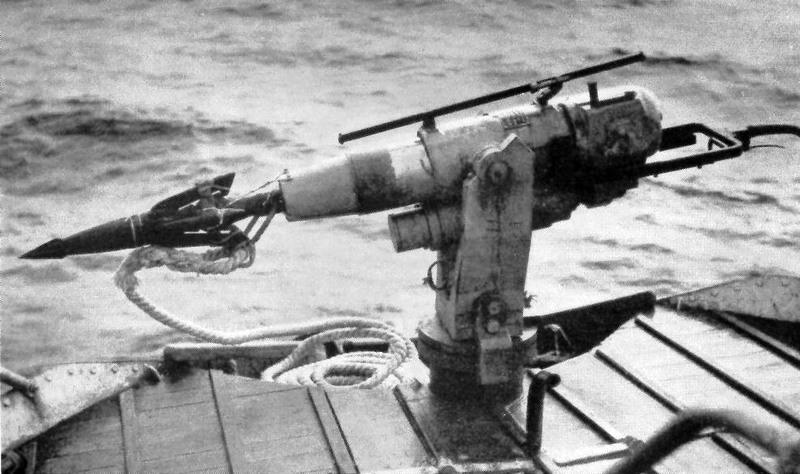 In 1868 Svend Foyn, a Norwegian, revolutionized the whaling industry forever with the invention of the exploding harpoon, and by using fast steam powered catcher boats. 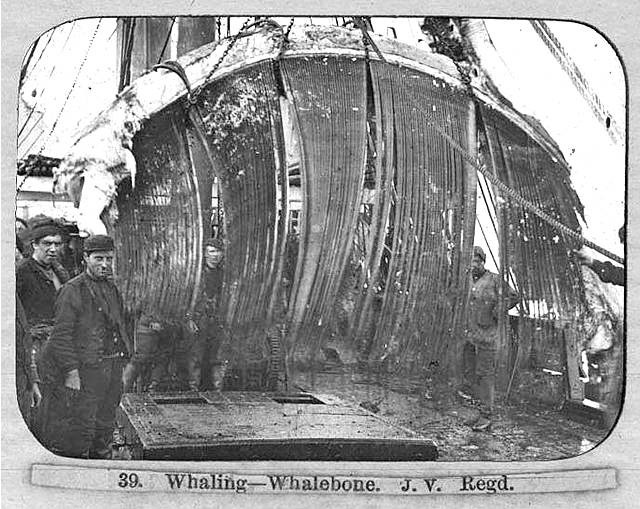 As a result of these technological advances, the whaling industry was able to focus on larger and more profitable species, beginning with the largest prizes of all - the Blue whale. A single 90-foot blue whale could yield up to 120 barrels of oil, and blue whales were killed by the thousands from about 1900 onwards. The slaughter peaked in 1931 when over 29,000 were killed in one season. After that blue whales became so scarce that the whalers turned to other smaller species, first of all the Fin whales and then when these in turn became scarce, to Sei whales in the 1960's and then to the much smaller Minke whales in the 1980's. Belatedly, the International Whaling Commission (IWC) banned all hunting of blue whales in 1966 and gave them worldwide protection. 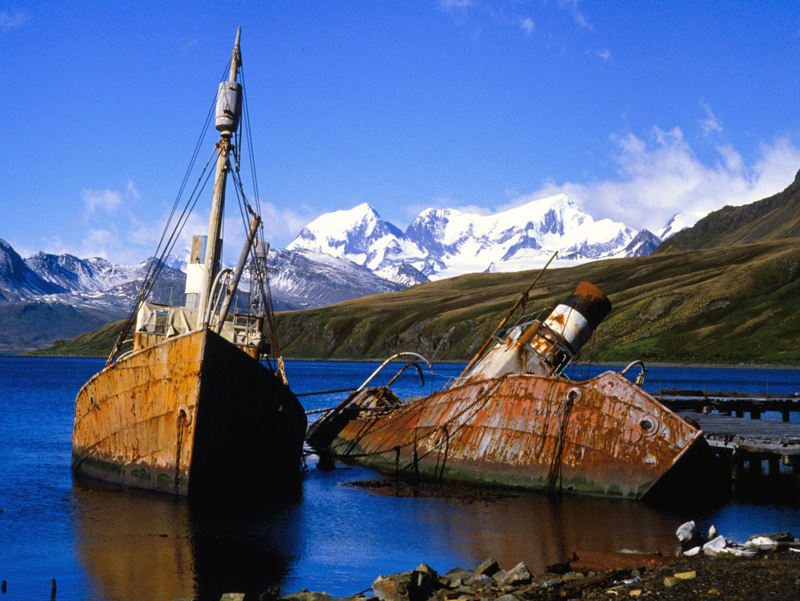 By this time their numbers had fallen from about 200,000 / 300,000 in pre-whaling days to 1-2000. They were still hunted illegally for another decade or so, for a whaling factory out at sea a big fat blue whale was too tempting a prize to ignore. The whaling industry is estimated to have accounted for 1.25 million whales weighing a total of 64 million tonnes. What were the whales used for? The chief whale products that were used were whale oil derived from the melted down blubber (a thick layer of fat beneath the skin that helps to insulate the whale from the icy seas) and "whale bone" not bone at all but made from keratin, the same protein that makes skin, nails, hair, hoofs and claws. Baleen comes from the large plates that many whales use to filter small food organisms from the sea. The uses of whale products changed as time progressed. In the heyday of Yankee whaling from around 1860 to 1890, sperm whales in particular and then right whales were the most sought after. The sperm whale supplied spermaceti, an oily, waxy substance in great quantity and the right whale also supplied large amounts of whale bone. The right gave plenty of blubber too, but the sperm whale less so. Towards the end of the 1800's, mineral oils from underground deposits and gas started to be used for lighting and so whale oil was no longer needed for these purposes, as a consequence the taking of sperm whales declined in favour of other species. There was still a great demand for whale oil that came from the blubber, but now in the main, this was used for making the finest soaps and also for the manufacture of margarine. Oil for lighting: Sperm whale oil burned slowly, without an offensive odor. It was considered one of the finest oils for illumination used in an oil lamp. Spermaceti was used to make the finest quality clean and odorless candles. 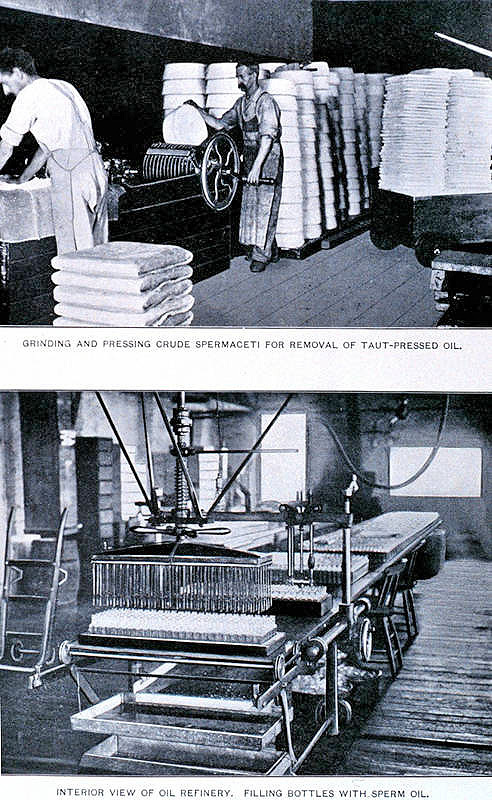 For lubricating: Whale-oil was processed into fine lubricating oils for industries such as clock making. The oil of the blackfish, a small, toothed whale, was prized for lubricating delicate machinery, such as chronometers on whale ships. The oil remained fluid even at very cold temperatures. Other uses: Although it was most prized for lighting and lubricating, whale oil was also used to manufacture soaps, varnish, cosmetics ("imparts a rich glossy sheen"), paint, glaze (on photographs), to process textiles and rope and burnt to provide heat. Baleen was used in a variety of nineteenth-century products. Buggy whips, Carriage springs, Corset stays, Fishing rods, Hoops for women's skirts, Umbrella ribs and many other applications where nowadays plastic or steel would be used. If baleen was not carefully cleaned as soon as removed from the whale's jaw, it developed an unpleasant smell that lowered its value. Special mention has to made to Sperm whales that provided some of the most prized and expensive whale products from the enormous "spermaceti" organ in the head from where the sperm whale gets its name. They also provided a substance from their stomachs called ambergris. Sperm whale oil derived from the spermaceti organ was considered the finest lubricating oil on Earth. A transparent, amber or straw colored and liquid at the whales' normal body temperature, it and hardens into a white wax at normal air temperature. This is a very fine oil that was used to lubricate fine machinery and provide the wax to produce special smokeless, odorless candles, that sold at about six times the price of a tallow candle. The wax was also used in the cosmetic industry, especially in the finest face and hand creams, since it was smoother than its nearest competitor, lanolin. Sperm whale oil was used as watch oil selling at $5.00 per ounce in 1957! Second quality oil was recovered from the thick blubber. More oil was obtained from the blubber than from the spermaceti organ in the massive head. The blubber can be as much as 18 inches thick on the shoulder and back, more than the width across your shoulders. This is a dark, waxy substance produced in the digestive tract of sperm whales. It is produced from the action of the stomach secretions on the hard "beaks" of the squid that sperm whales mainly feed on. It has been valued since ancient times. It might be vomited by a sperm whale during its death flurry, regurgitated (like a hairball), evacuated through the bowel or discovered when the carcass was processed. It also has been found floating at sea or washed up on a beach, with no whales in sight.